French operatic baritone and actor Jean Périer (1869-1954) had a long association with the Opéra-Comique in Paris. Although he sang principally within the operetta repertoire, Périer portrayed roles in operas by Mozart and Puccini, and he originated the role of Pelléas in Debussy's Pelléas et Mélisande in 1902. 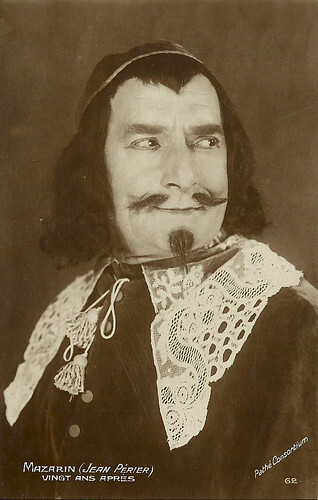 Périer also appeared over 30 films between 1910 and 1948 and he played Cardinal Mazarin in the serial Vingt Ans Après/The Return of the Musketeers (Henri Diamant-Berger, 1922) based on a novel by Alexandre Dumas Père. French postcard by Cinémagazine Edition, no. 62. Photo: Pathé Consortium Cinéma. Publicity still for Vingt Ans Après/The Return of the Musketeers with Jean Périer as Mazarin. Collection: Didier Hanson. Jean Alexis Périer was born in Paris in 1869. He was the son of Belgian parents. His father was an opera singer and repetiteur. His older brother was the popular singer Camille Périer ‘Kam-Hill’. After initially working at the Credit Lyonnais bank, he became a pupil of Émile-Alexandre Taskin (opéra comique) and Romain Bussine (singing) at the Paris Conservatoire, winning first prizes in both in 1892. He made his debut as Monostatos in Wolfgang Amadeus Mozart's The Magic Flute at the Opéra-Comique later that year. He continued to perform at that opera house until 1920, with the exception of the years 1894 through 1900 when he principally sang at the Théâtre des Bouffes Parisiens and other Parisian theatres specialising in operetta. Although he performed in a many operettas, he also sang a number of operatic roles including the title role in Don Giovanni, Lescaut in Manon Lescaut, and Scarpia in Tosca. His career was almost entirely centred in Paris, particularly at the Opéra-Comique, where he notably created the role of Pelléas in Claude Debussy's Pelléas et Mélisande. He repeated the role of Pelléas at the Manhattan Opera Company in 1908 and at the Opéra de Monte-Carlo. Périer appeared in numerous other world premieres, most notably Ramiro in Maurice Ravel's L'heure espagnole (1911) and leading roles in Andre Messager's Véronique (1898) and Fortunio (1907). Périer also played the speaking role of Brother Dominic in the premiere of Arthur Honegger's dramatic oratorio Jeanne d'Arc au Bûcher (Joan of Arc at the Stake) in Basle in 1938, with Ida Rubinstein. Although described as a baritone, he created roles for Debussy and Ravel in the Baryton-Martin register (light baritone). His was a declamatory art, and he created convincing characters with the help of his clear diction and his ability as an actor. In addition to his opera career, Jean Périer acted in several films between 1900 and 1938. His first film appearances were in silent shorts, produced by the Pathé Frères: Monsieur Don Quichotte (1910) with Pierre Magnier, L'enfance d'Oliver Twist/Oliver Twist (Camille de Morlhon, 1910), and Manon (1910) featuring Marthe Regnier and based on the novel by Abbé Prevost. More than ten years later he played Cardinal Mazarin in the 10-part serial Vingt Ans Après (Henri Diamant-Berger, 1922) with Pierre de Guingand. It is a sequel to Les Trois Mousquetaires/The Three Musketeers (Henri Diamant-Berger, 1921) and also based on a novel by Alexandre Dumas Père. His last silent film was Poker d'as/Four Aces (Henri Desfontaines, 1927) starring René Navarre. Périer had a dry and husky voice which did well in the sound cinema. His sound debut was as a judge in the crime film Autour d'une enquête/Inquest (Henri Chomette, Robert Siodmak, 1931) with Annabella. It was one of the many alternate language versions of German films, in this case the UFA production Voruntersuchung/Inquest (Robert Siodmak, 1931). In the following years, many film roles followed, like in the Paramount production Simone est comme ça/Simone is like that (Karl Anton, 1932) with Meg Lemonnier, La belle aventure/The Beautiful Adventure (Roger Le Bon, Reinhold Schünzel, 1932) with Käthe von Nagy, and Roi de Camargue/King of the Camargue (Jacques de Baroncelli, 1934) with Charles Vanel. In Pasteur (Sacha Guitry, 1935) he played a doctor opposite director Sacha Guitry himself in the title role. James Travers at Films de France: “Sacha Guitry’s first sound film is as much a tribute to his father, Lucien Guitry, as to the great French scientist Louis Pasteur. The film is closely based on a stage play which Lucien Guitry wrote and took the lead role in during the 1920s. In playing the character of Pasteur in his film, Sacha Guitry is reputed to have modelled his performance on that of his father (who died in 1925), to preserve the memory of his father’s performance. Guitry also wrote a powerful script for the film, which consists mainly of long monologues and – most unusually – includes no female characters”. Jean Périer played a lord in the mystery Mister Flow (Robert Siodmak, 1936) featuring Louis Jouvet, and another lord in the Oscar Wilde adaptation Une femme sans importance/A Woman of No Importance (Jean Choux, 1937). He reunited with Sacha Guitry for the historical comedy Remontons les Champs-Élysées/Champs-Elysees (Sacha Guitry, 1938). After retiring as an opera singer in 1938, Périer worked on as an acting and singing teacher in Paris and also continued to appear in supporting roles in films. He played a president in the musical Les trois valses/Three Waltzes (Ludwig Berger, 1938) starring Yvonne Printemps, and also in the Johann Wolfgang Goethe adaptation Le roman de Werther/Werther (Max Ophüls, 1938) with Pierre Richard-Willm in the title role, and in the propaganda film Entente cordiale/Cordial agreement (Marcel L’Herbier, 1939) starring Gaby Morlay as Queen Victoria. He also played Count Charles Talleyrand twice: in the lavish historical drama Le destin fabuleux de Désirée Clary/Mlle. Desiree (Sacha Guitry, 1942) starring Guitry himself as Napoléon, and in Un seul amour/A single love (Pierre Blanchar, 1943) based on a novel by Honoré de Balzac. After the war he appeared in two more films: the mystic drama La septième porte/The Seventh Door (André Zwoboda, 1948) starring Georges Marchal, and finally he was one more time reunited with Sacha Guitry for Le comédien/The Private Life of an Actor (Sacha Guitry, 1948) in which he played himself. In 1954, Jean Périer died in Neuilly-sur-Seine, Paris. He was 85. Reconstruction of the stage play Une étoile nouvelle/A New Star (1924) by and with Sacha Guitry. Source: ben77114gaut (YouTube). 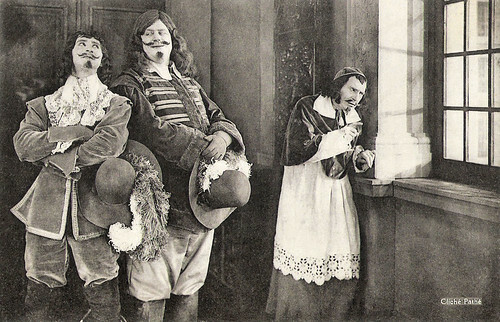 Tomorrow: Vingt ans après/The Return of the Musketeers (Henri Diamant-Berger, 1922). Sources: James Travers (Films de France), Wikipedia, and IMDb.